Spending your camper van holidays in Sardinia is a unique experience, as you get up-close and personal with the breathtaking panoramas that our island has to offer. 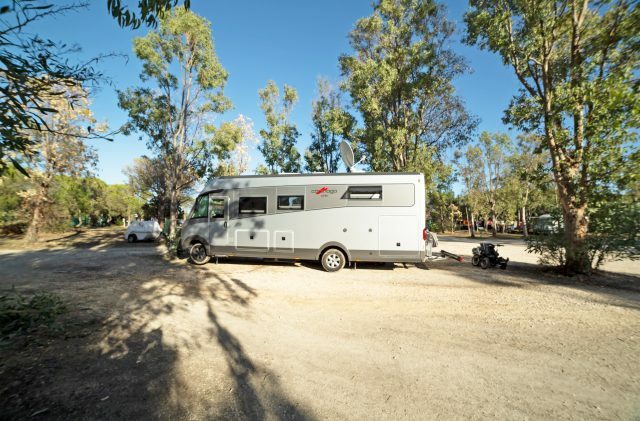 In spring and autumn, there is a greater choice of pitches available for large camper vans. Pitches for XL campers (i.e. those that are longer than 7 metres) include access to a nearby power supply - use of which is included in the price - that is compliant with CEE regulations (max 5A), alongside all of the facilities that are available free of charge for guests, including hot showers, potable water and Wi-Fi in the bar area. On the campsite, you can savour the local delights from land and sea in the Ristorante Pizzeria. You can also do some grocery shopping at the Market, which is well-stocked with authentic Sardinian products, as well as gas cylinders. You can also hire kayaks, windsurfing equipment and mountain bikes, for unforgettable excursions through the stunning surroundings. On your camper van holidays in Sardinia, the cost of the stay includes the camper van service, provided in the dedicated areas, the location of which can be seen on the Camping Cala Ginepro map.